Provide comfort for the family of Amy Wellington with a meaningful gesture of sympathy. Amy Veronica McLean (Wellington) was born in Manchester, Jamaica on May 29, 1929 to Mr. Clarence McLean and Ms. Susan Hutchinson. 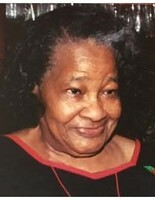 She went home to be with the Lord on March 11, 2019 at the age of 89. Amy graduated from Porus Secondary School and married Mr. Owen George Wellington (deceased). She eventually immigrated to the United States with her husband and two youngest children on April 21, 1988. Amy was a woman of faith who loved God with her entire being. When she resided in Jamaica she was a devote member of the Porus Church of God. Once she migrated to the United States, she became a lifelong member of the House of Deliverance Church of God (formerly Mattapan C.O.G.). Amy enveloped kindness like no other and was always concerned about the wellbeing of others. She was a giver in deed and could capture your heart with just one smile. She was a dedicated and loving wife, mother, sister, aunt, grandmother, great grandmother and dear friend. Amy will truly be missed by all who knew and loved her and her memories will be cherished and live on in the hearts of her family and friends. She leaves behind: Three sisters: Joyce Richards, Susalin Durham, Patsy McLean; Seven Brothers: Leslie McLean, Lester McLean, Roy McLean, Clarence McLean, Joslin McLean, Joseph McLean, Hector McLean; Four Daughters: Claudette Wellington, Novelette Wellington (deceased), Yvonne Chance, Phyllis Wellington; Three Sons: Decosta Wellington, Delissa Wellington, Lloyd Wellington; Fourteen Grandchildren; Thirteen Great grandchildren and a host of relatives and friends. There will be a Viewing on Saturday March 23, 2019 from 10:00 to 11:00am followed by Funeral Service at 11:00 O'clock at House Of Deliverance New Testament Church Of God, 424 Washington Street, Dorchester, MA 02124. To send flowers in memory of Amy Veronica Wellington, please visit our Heartfelt Sympathies Store. Provide comfort for the family of Amy Veronica Wellington by sending flowers.